There's a myriad of novel noninvasive devices primed to hit the market and revolutionize the way patients measure blood sugar. As research is ongoing, one of the main goals is to make blood glucose tracking easier for patients with diabetes. The Photonic Glucose Sensor by Onsens is a brand new non-invasive technology which uses near-infrared lights to sense blood sugar levels. Patients wear a near-infrared light-emitting sensor on the upper extremities. If light from the sensor is reflected at a narrow angle from the skin, this implies that glucose levels are lower, whereas a wide angle of reflection indicates high glucose levels in the skin. While the photonic glucose sensor will be unable to measure actual blood glucose levels, it will be able to detect a trend of rising or falling blood glucose and trigger alarms when hypoglycemia is imminent. At this time, this sensor is not yet available on the market. Another device, HypoMon, was developed by AiMedics to non-invasively detect sleep-time hypoglycemia in children and young adults with type 1 diabetes. Interestingly, it doesn’t actually measure blood sugar levels but rather detects the physiologic responses to low sugar levels, which then trigger an alarm in the monitor. In patients with frequent hypoglycemia, however, the physiologic response may become blunted over time. This is known as hypoglycemic unawareness and may limit the efficacy of this technology. In addition, excessive movement and sweating can trigger false alarms. The Sentek Group also developed new technology called the Crystalline Colloidal Array. This array is used in a product called the Glucoview ocular insert, which is placed under the eyelid. It is used to sense the glucose level in the tear fluid, which has been shown to correlate well with glucose levels in the bloodstream. In January 2014, Google announced that it is also jumping on the bandwagon by developing contact lenses for the detection of glucose in tears. 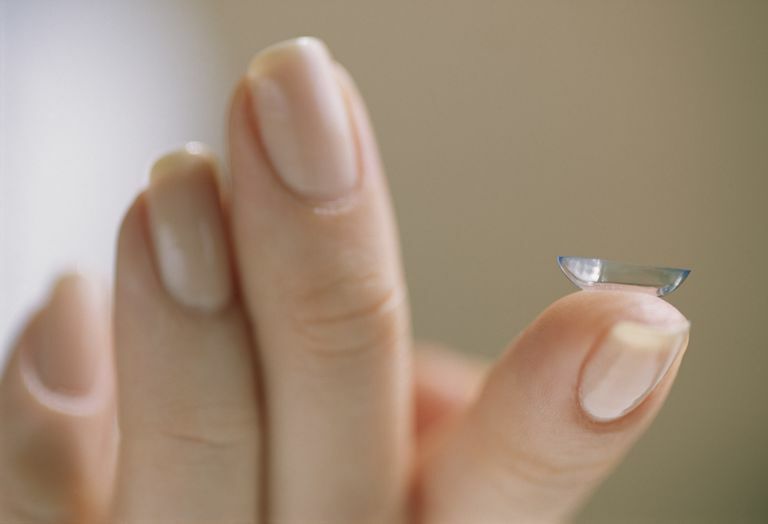 The lenses use a tiny wireless chip and miniaturized glucose sensor embedded within two layers of contact lenses in order to detect glucose levels nearly every second. Google plans to add an LED light which will light up to warn the user of hypo and hyperglycemia. Similarly, the GlucoScope Monitor by Visual Pathways measures glucose levels in the fluid of the anterior chamber of the eye using a handheld device which looks like a pair of binoculars and uses infrared light to quickly measure glucose levels in the eye. New technologies are also looking into noninvasive glucose monitoring using the skin. The Symphony Diabetes Management system is being developed through a partnership with Sontra and Bayer Diagnostics. A biosensor patch will measure glucose diffusing through ultrasonically permeated skin. A German company, ArithMed, working in conjunction with Samsung, developed a machine called GluControl GC300 which is designed to use non-invasive electromagnetic radiant ray to determine glucose levels. It is being developed for home use, and a press release is thought to be imminent. LighTouch Medical developed a product which uses a complicated and seemingly indecipherable technique called Rama-based spectroscopy to measure blood glucose by projecting a specific color of light into the patient’s fingertip. The light then bounces back to the monitor and is analyzed to determine the blood glucose level. While clinical trials on this monitor began in 1999, full FDA testing approval is still pending. Along the same lines, Orsense, a company based in Israel, developed a product called the NBM 200MP based on a newly developed technology called occlusion spectroscopy. Pressure is applied to a patient’s fingers to temporarily halt the flow of blood and create what is known as a “tissue signal.” Once the pressure is removed and blood flow resumes, a second measurement creates a signal which allows for the measurement of glucose.